The "sun" toy attachment on the activity jumper can rebound with force and injure the infant, posing an impact hazard. The firm has received 100 reports of incidents including 61 injuries. Reported injuries include bruises, lacerations to the face, a 7-month-old boy who sustained a lineal skull fracture and a chipped tooth to an adult. 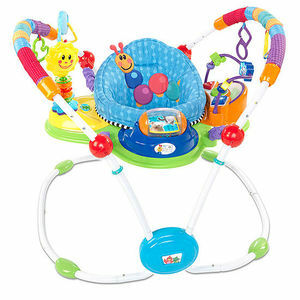 This recall includes about 400,000 Baby Einstein Musical Motion Activity Jumpers with model number 90564. The model number can be found on a tag attached to the underside of the seat. These stationary activity centers have a support seat covered in blue fabric attached to a large white metal frame and include a variety of brightly colored toys surrounding the seat. The yellow sun toy is attached to the seat frame on a flexible stalk with either three or five brightly colored rings. A date code is located in the lower right corner of the sewn in label on the back of the blue seat pad. The following date codes, indicating a manufacture date prior to November 2011 are included in the recall: OD0, OE0, OF0, OG0, OH0, OI0, OJ0, OK0, OL0, OA1, OB1, OC1, OD1, OE1, OF1, OG1, OH1, OI1, OJ1 and OK1. Target, Toys R Us and other retails stores nationwide and online at Amazon.com between May 2010 and May 2013 for about $90. Consumers should immediately stop using the product and contact Kids II for a replacement toy attachment. For more information, call (877) 325-7056 or go online to kidsii.com, then click on the Recall link at the bottom of the page. Kids II toll-free at (877) 325-7056 from 8 a.m. to 5 p.m. ET Monday through Friday or online at www.kidsii.com, then click on the Recall link at the bottom of the page for more information.